I realized a long time ago that after-life just can't exist. Because alive humans made it up with their alive brains, and once we die, well, there's no activity to keep us alive. Because no brains. It's scary, I know, because some people want to exist forever, or at least keep their existence meaningful forever. So we'll do a lot of things and believe a lot of things to tell ourselves that our existence won't end. Now, add religion to the picture (I try to write broadly of any type of religion). We find a rule book of sorts that helps us know how to live our Earth-lives the right way to have a meaningful existence forever. And a lot of powerful people make a lot of money off us as we desperately try to follow these rules correctly. Unsurprisingly, we've all developed different ways of interpreting the rule book, and will give our money to the people who tell us the way we WANT to interpret the rule book. So, we're not doing anything special. We're just following what we like to hear. No matter what your persuasion is, you go where you feel most comfortable and safe. It's OK. We're all human like that. 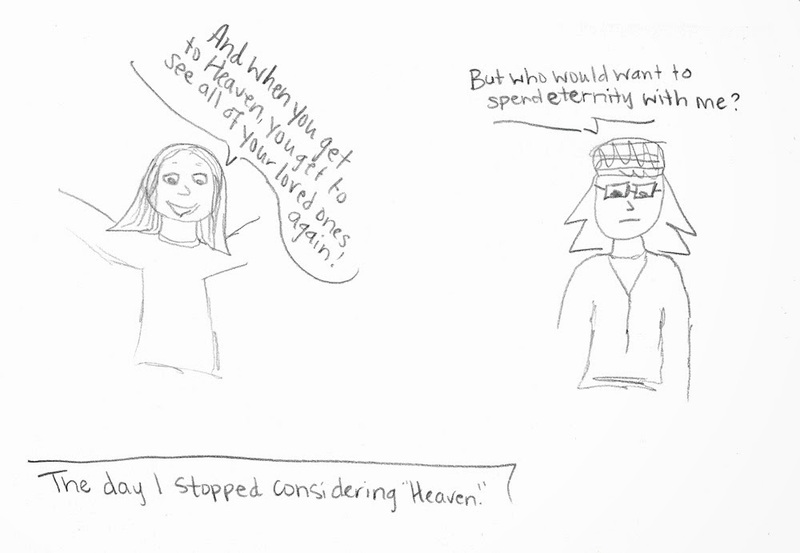 The closest thing I can come to trying to explain an experience of "Heaven" is reconciliation. Now, what we aim reconcile to/with is the root of our spirituality, I guess, and dictates how we behave while we are alive. Some will say the ultimate reconciliation is meeting God in Heaven, or experiencing Nirvana, or whatever. But my brain just can't think like that anymore. I'm under the impression this Earthly existence is all we have. So, acceptance of myself, acceptance of all other creatures' right to exist, doing my part to help everyone on this crazy floating space rock is about all the Heaven I can get to. When I feel like I've accomplished that, I'll let you know.